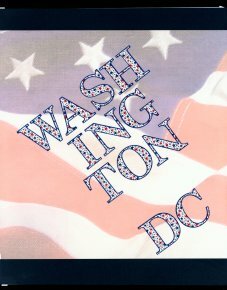 This cover page for the Washington DC Scrapbook is very simple and serves to announce the topic of the book. Made with one page of Club Scrap flag paper from the "Freedom Collection Kit", bordered with 2 strips of navy blue cardstock. The lettering was from my stash, Blue Bordered lettering with red, white and blue stars. 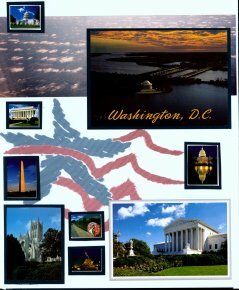 No date as the photos, post cards and brochures in the album represent a number of trips and tours to the DC area. Because of the large number of photos and post cards I had, I used a 12 x 15 inch album to give me more space to work with. Where I have used 12 x 12 papers I needed to fill in that extra 3 inches on the top or bottom, so I used border strips, color blocking and panoramic photos (4 x 12 inches) to complete the pages. 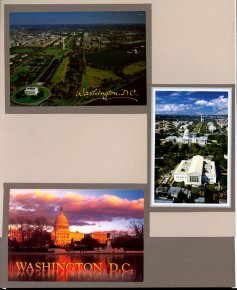 These first two pages of the Washington DC Scrapbook are all post cards of the Washington DC area, several depict aerial views. These pages depict more focused views of what is to come later in the book. Both background papers are again from the Club Scrap "Freedom Collection Kit", bordered at the top with 2 panoramic photos (4 x 12) depicting the cloud formations that I thought tied in with the aerial photos. Most photos are matted with either navy blue cardstock from the kit, or double matted with white and silver, to make then stand out from the background. Also used were 2 holographic American Flag stickers matted on the navy blue card stock. 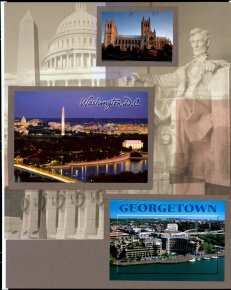 I have used more postcards on these pages of the Washington DC Scrapbook. The background paper on the left is Washington DC collage paper that I picked up from Scrap Your Trip.com for $.65 and is matched with Bling Cardstock by Bazzill in light tan (Blank Check) and taupe (Flat Broke) that matched the colors in the DC Collage paper. 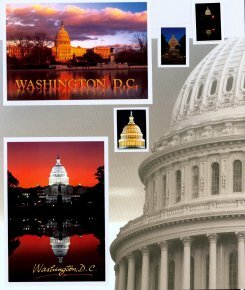 All post cards are matted or blocked using the darker taupe Bling cardstock. 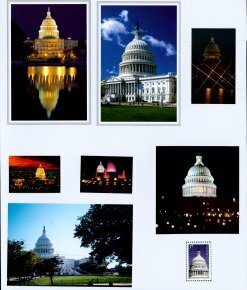 Here is a mixture of post cards and my own photos taken of both day and night views of the Washington DC US Capitol Building. Background paper on the left showing the Capitol Building is also from Scrap Your Trip.com for $.65 and is matched here with Bling Cardstock by Bazzill in light Pearl (String of Pearls) that matched the colors of the building. Photos on the left page are double matted with Bling pearl and silver; the photos on the right are matted with the Bling pearl to contrast but coordinate with the background papers. 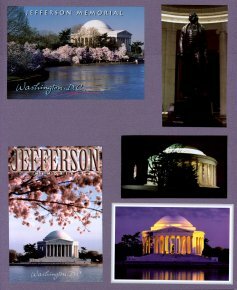 These next pages from the Washington DC Scrapbook shows post cards and my own photos from the Jefferson Memorial, the Washington Monument, and the famous Cherry Trees in bloom. The 3,000 cherry trees were a 1912 gift from Mayor Yukio Ozaki of Tokyo to the city of Washington. The background papers here follow the same format as previous pages. The background of the Washington Monument and the cherry trees is matched with the Bazzill Bling cardstock in a Lavender (Puppy Love). 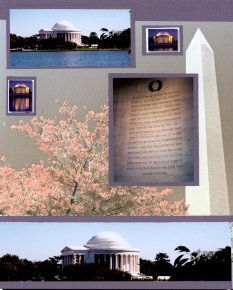 I have used a Copic Alcolol Ink Sketch Marker in Blush (R020) to color in the pink on the cherry tree blossoms to highlight & coordinate with the ones in the photos from the Jefferson Memorial. The panoramic photo at the bottom shows the Jefferson Memorial from across the Potomac River. 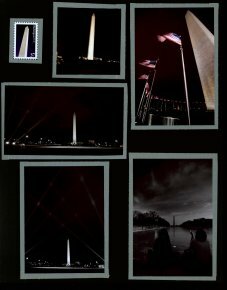 These next photos in the Washington DC Scrapbook show various views of the Washington Monument. The first photo upper left was taken from the apex of the Vietnam War Memorial. This photo was taken in 1999 by Larry Powell and was actually cut from a calendar. Due to the night time focus of the majority of these phots, there were all matted on Metallic Textured "Gunmetal" from DCWV Metallic Stack and placed on a plain black ackground. These matte stacks come in 12 x 12 and 8 x 8 sizes. The very small color photo was left over from one of the post cards and the other small photo was from a group of Washington DC sticker stamp images purchased from Stamping Station.com and designed by Garrett McFarland. 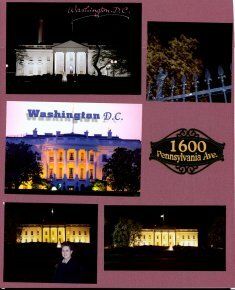 These next pages of the Washington DC Scrapbook focus on post cards and my own photos of the White House. 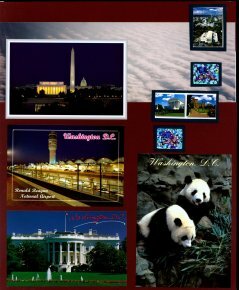 For these pages I have used the same ideas for the background paper, one with a water mark type photo of the American Flag and the opposing page using Bazzill Bling in a coordinating red called Red Carpet. The Red Carpet Bling was also used to matte photos on the printed paper background. The smaller photos were left over from post card packs. 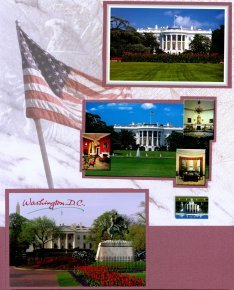 The 4-layer Die Cut of 1600 Pennsylvania Avenue was also purchased from Scrap Your Trip.com at a cost of $2.00. 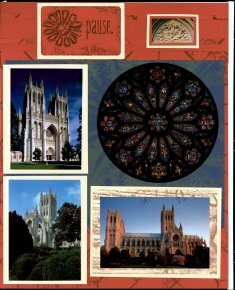 These next three sets of layouts in the Washington DC Scrapbook feature the National Cathedral and all used the papers from the Club Scrap Kit Rhapsody from March 2007 which focused on ivory, rust and blue cardstocks. 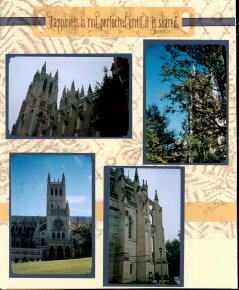 Since photography was not allowed inside Mount Saint Alban's National Cathedral, I purchased post card books from the gift shop. My favorite on this page is the round photo of the North Rose Window entitled the Last Judgement by Laurence B Saint. The mattes for the photos and journal blocks were double and single mattes using the ivory printed and solid cardstocks. 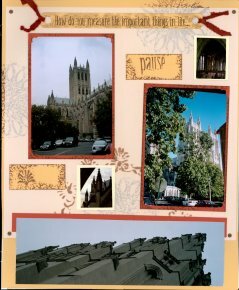 Here are more post cards combined with some of my own photos of the Washington National Cathedral. 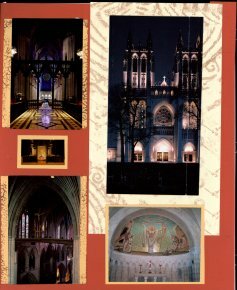 The beautiful night photo of the lit up Cathedral was from the front of the brochure I picked up at the entrance which included information about how to become a member of the National Cathedral Association. The right page uses a combination of small and large post cards and photos matted in rust, with some journaling blocks and rust fibers and brads. The text on the blocks read "Pause" and "How do you measure the important things in life?" were part of the embellishments that came with the Club Scrap Kit "Rhapsody". 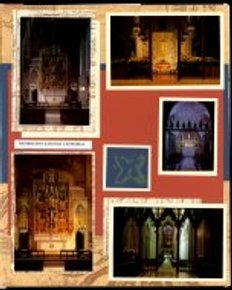 The Panoramic Photo (cut down to 4 x 11) at the bottom of the right page was taken outside looking straight up the side of the Cathedral and reminds me of the feeling of the tremendous height of the Cathedral. 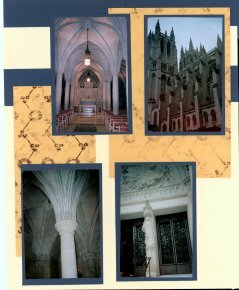 These last two layouts from the National Cathedral in the Washington DC Scrapbook, were my own photos. Again all papers were from the Club Scrap Kit from March 2007 called "Rhapsody". The journaling title 'Happiness is not perfect until it is shared" mounted with the blue ribbon was also part of the Club Scrap Kit "Rhapsody". 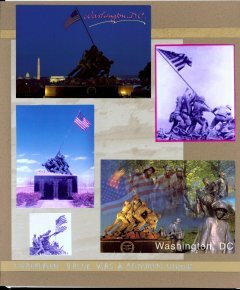 And to end this volume I of the Washington DC Scrapbook are the layouts of the U. S. Marine Corps War Memorial/Iwo Jima. The background papers were solid tan cardstock and a tan and white printed text weight paper. Paper Ribbons cut from a third color of tan cardstock embellish both pages. The journaling, written in gold pen on the paper ribbon, reads "Uncommon Valor was a Common Virtue" - Admiral Nimitz. 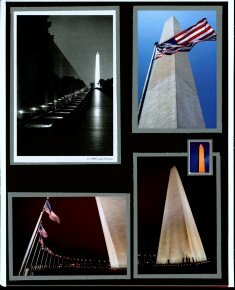 These photos were a combination of purchased post cards and my own photos taken from several different angles walking around the memorial. In doing that I found it amazing that the flag and flag pole appeared to move up or down depending on the direction in which I moved. I was struck by the magnitude of this Memorial. 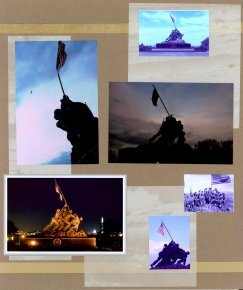 To see more Marine Corps Museum Scrapbook Layouts, click here to go to my National Marine Corps Museum Scrapbook, Quantico Va.